The third recording by this Spanish band finds them deeply immersed in the music of Greece, the Balkans and the Adriatic. The band says: "COR DE PORC ("Pig Heart") suggests the idea of the eternal coming and going through life with sadness and the natural imperfection which makes us (both musicians and the rest of the human race) like a pig attempting to wrench notes from a harp, when comparing with the ideal of perfection that we have. However much a man evolves, studies, investigates and wastes sleeping hours in the madness of being, he will never be more than this, a lonely pig with eternal insatisfaction like a hump." EFRÉN LÓPEZ: Oud, Cura Saz, Meydan Saz, Divan, Baglama, Cretan Laouto, Lavta, Trompa Marina, Hurdy-Gurdy, Gittern, Persian Santoor, Langeleik, Afghan Robab, Tanpura, Kanoun, Medieval Lute, Çümbüs Tanbur, Çümbüs Oud, Horn, Galician Pandero. DIEGO LÓPEZ: Davoul, Bendir, Doira, Tombak, Daire, Udu, Riq, Table, Spoons, Duff, Finger Cymbals. EDUARD NAVARRO: Galician Bagpipe, Bulgarrian Bagpipe, Graile, Spanish Shawn, Moraharpa. OSVALDO JORGE: Tabla, Ghatam, Kanjira. JUAN MANUEL RUBIO: Medieval Harp. VANESA MUELA: Spoons, Tapadera, Tambourine., Voice..
JOSEP MARIA RIBELLES: Celtic Harp. PANTELIS PAVLIDIS: Lyra from Pontos (Black Sea). DAVID ANTICH: Arrangements for medieval lutes on "Jorn e Nit". Power and beauty are the two main concepts in their music, and fire and water the contrary elements that are symbolized by their name. L'Ham de Foc (Fish hook of fire) from Valencia are no longer an exotic musical phenomenon for specialists but a well sounding name within the international worldmusic scene and a timeless musical concept, that develops its strong character without taking care of current fashion. A new instrument, a new musical style can only be studied and understood going to where it comes from and within its cultural context. This attitude was responsable for a lot of journeys especially to Greece where the main protagonists of L'Ham de Foc -singer Mara Aranda and multiinstrumentalist Efrén López- have now found their second home. Their compositions have the ability to transform music for specialists into an understandable but profound music. Each album of L'Ham de Foc reflects what they have experienced in their recent journeys and studies. L'Ham de Foc´s audience is as diverse as their instruments and influences: with their concerts and CDs , apart from the standard worldmusic/folk audience, they have also reached listeners coming from classical music, Rock/Pop, Gothic/Wave and medieval music. Three years passed by between the surprising and acclaimed debut album „U“ and its successor „Cançó de Dona i Home“, their second album that meant a first international surprise being the only european worldmusic album that reached a position within the Top 10 of the annual WMCE charts list. 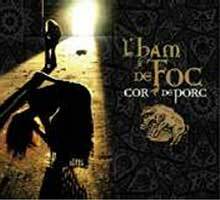 Once again the band took a break of three years to release „Cor de Porc“. Before entering the studio they spent six month in Thessaloniki (Greece) to study the music of the Ottoman Empire that is still vivid and being played on the Ud in Turkey, Greece and Armenia. For the first time L'Ham de Foc has worked a very typical style from Valencia into their music: the Cant d´estil. This tradition sounds like Flamenco due to the melismatic melodies. A poet is whispering the lyrics into the singer's ear who improvises over a fixed melodic basis. L'Ham de Foc also works on other traditional rhythms from Spain, like the Jota, and uses archaic and popular percussion like spoons, pots or a wooden table, played by Vanesa Muela as a basic rhythm, while new band member Osvaldo Jorge plays the Indian percussion instruments like Tabla, Kanjira or Ghatam and is responsible for the more specific and detailed pecussion. Stunning musical dialogues are developped on the Tomback (another percussion instrument) between Masur from Iran and band member Diego López. Again multiinstrumentalist Efrén López has introduced various new instruments in the sound universe of L'Ham de Foc. The whole family of the turkish Saz (string instrument) that consists of 6 instruments with different sizes has been involved in the repertoire and has strongly influenced the music. As guestmusicians on „Cor de Porc“ Mara and Efrén introduced some of the musicians they played with when they were living in Thessaloniki: Hristos Barbas on the Ney and Kaval, Pantelis Paylidis on the Lyra from the Black Sea and Nikos Tzamis on the Lyra from Crete. With German Ralf Eickmeier on the Lyra and the Rebec another friend from their stay in Greece is to be heard on this album. From Spain they invited: Josep María Ribelles and Maria Laffitte who was an important influence for L'Ham de Foc with her CD „Trobadors“. „Cor de Porc“ is the result of a long musical meditation. Out of more than 40 hours of material, that was recorded between Valencia and Thessaloniki, L'Ham de Foc produced 12 songs with a delicate selection of instruments, melodies and rhythms that make their music so unique. COR DE PORC ("Pig Heart") suggests the idea of the eternal coming and going through life with sadness and the natural imperfection which makes us (both musicians and the rest of the human race) like a pig attempting to wrench notes from a harp, when comparing with the ideal of perfection that we have. However much a man evolves, studies, investigates and wastes sleeping hours in the madness of being, he will never be more than this, a lonely pig with eternal insatisfaction like a hump.